I’m so pleased to learn about this technique from K2Karen, who posted about it on Ravelry; I hope it will be just as delightful for you! 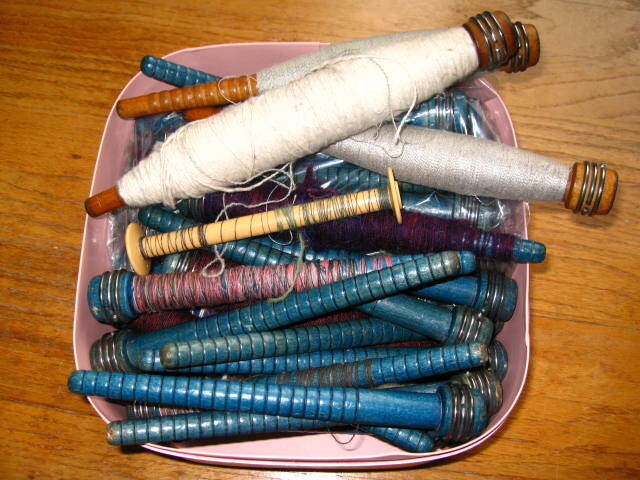 I always wind off my spinning singles onto storage bobbins before plying. 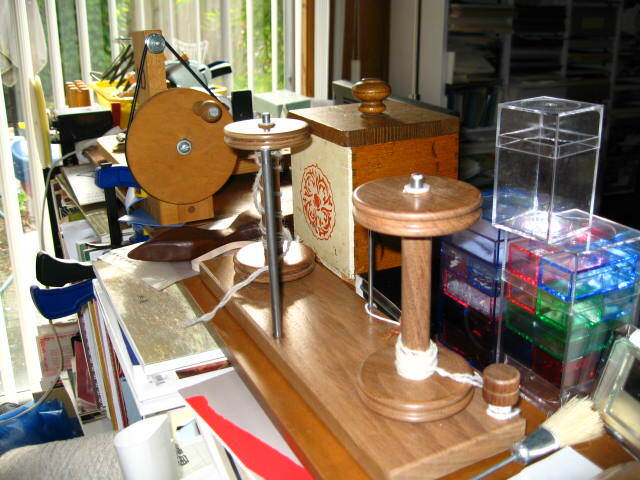 I have three bobbin winders, one for each room I’m likely to be weaving or spinning in (how lazy is that! 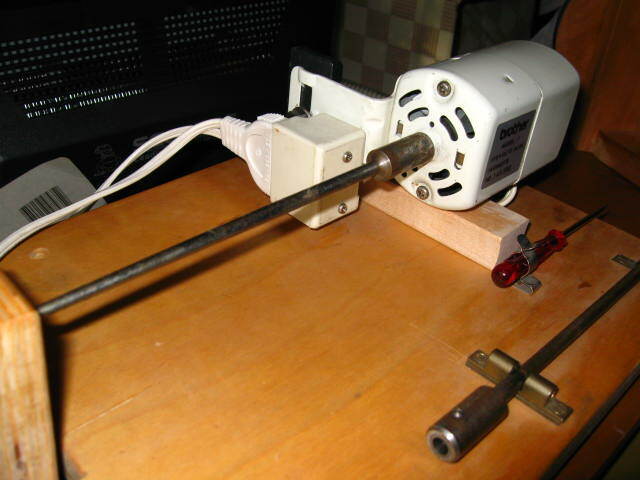 ), but have been wanting an inexpensive and portable winder I can take along with me on trips. For the past few months, I have been half-heartedly bidding on (without winning) a Swedish winder on eBay, but have been put-off by the prices, even old and used. 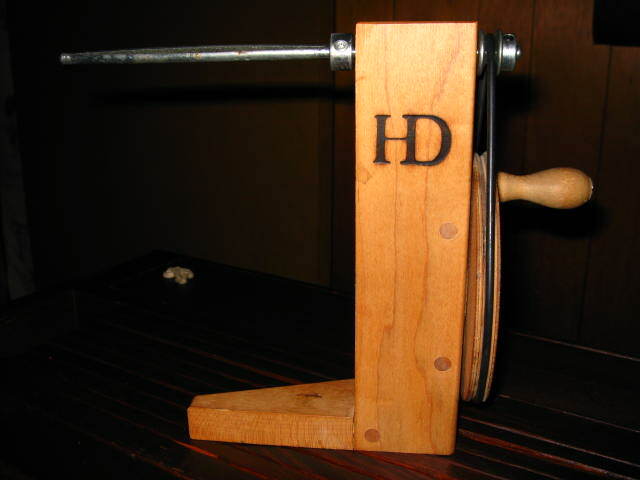 Although the winding ratio on the Swedish winder is supposedly slightly higher than that on my Harrisville Designs models, the HD serves my purposes well enough. Plus, the Swedish winders don’t offer much savings in terms of weight or bulk, i.e. portability. And then again, the cost. Enter the portable mini-mixer. Upon learning of it, I immediately ran to my kitchen drawer where mine (even cheaper!) has been sitting untouched for at least five years. 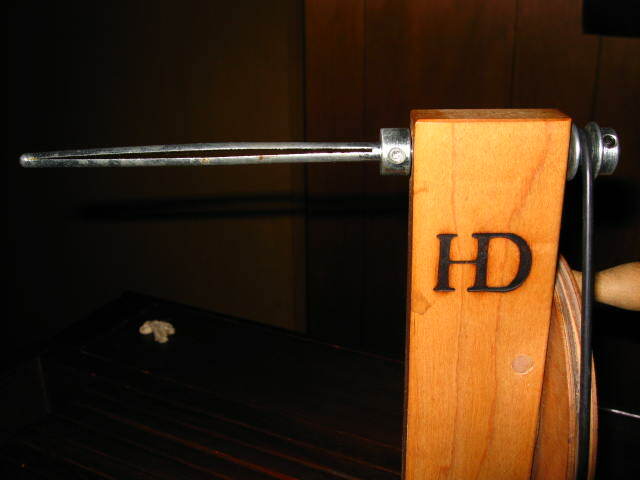 It was a thoughtful gift from a friend, as a tool to whip milk or cream into froth. Because of dairy allergies, I’ve used it just a few times, but kept it because it’s so cool (it never once occurred to me to mix drinks!). I’m relieved to find that the batteries haven’t leaked and corroded. I thought the mixer had been there only half a decade, but finding that that batteries have expired in 2002, wonder if it isn’t closer to twice that! The fancier mixer has all sorts of attachments, but the stick-like attachment (the only one that came with my no-frills model) is the one we’ll be using here. 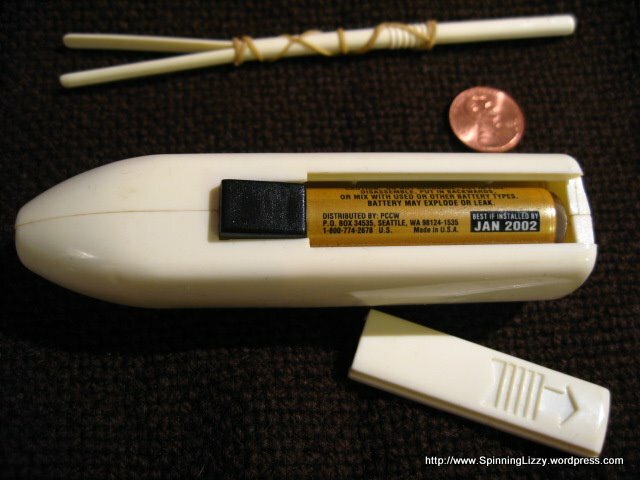 Wind a rubber band around the stick, and Leclerc polystyrene bobbins will fit snugly. 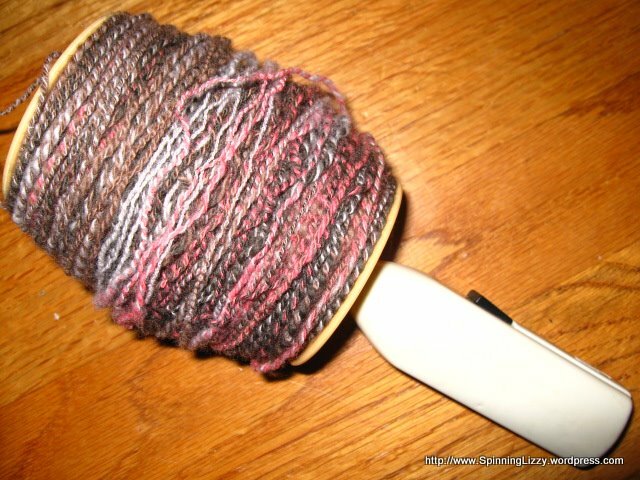 I decided to wind off a skein of 3-ply handspun (that had been first transferred to a cone) onto Leclerc’s largest bobbin. 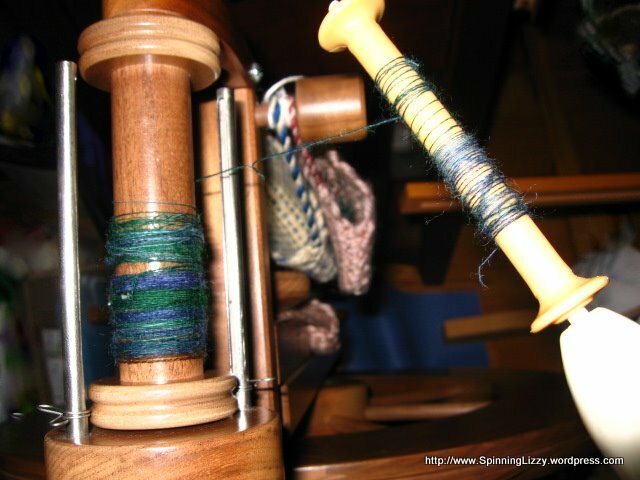 I was surprised how fast the mixer spun the bobbin. 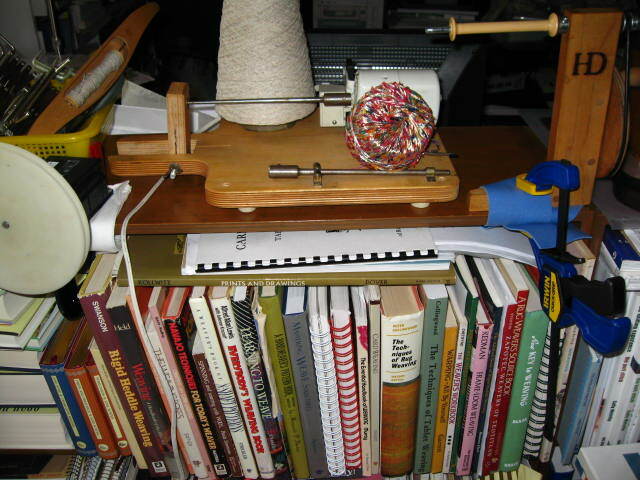 Of course, it slowed down noticeably by the time the bobbin was halfway-filled. 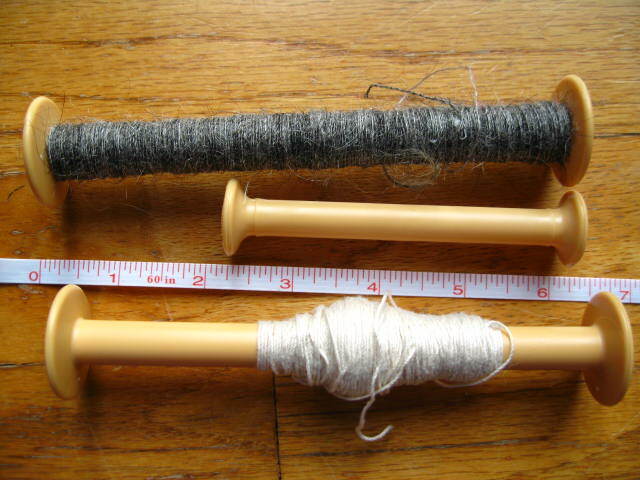 As long as the yarn feed was kept free of tension, the mixer was able to wind, up until the time the bobbin started to overfill. It was an unfair test. 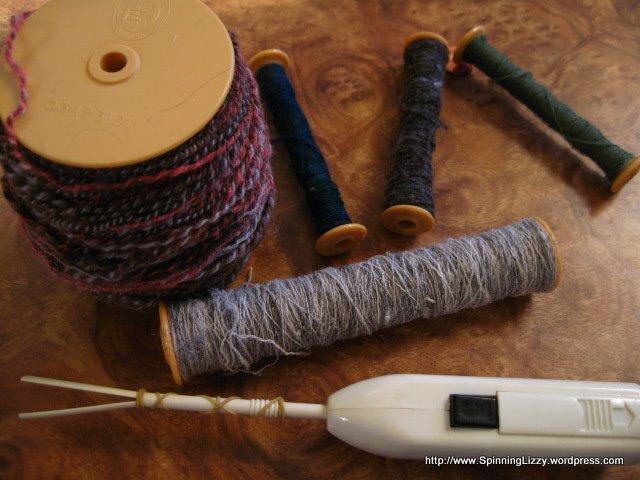 The mixer with batteries weighs 3-3/8 ounces, whilst the yarn wound on the Leclerc bobbin, it (without mixer) weighs 3-7/8 ounces. 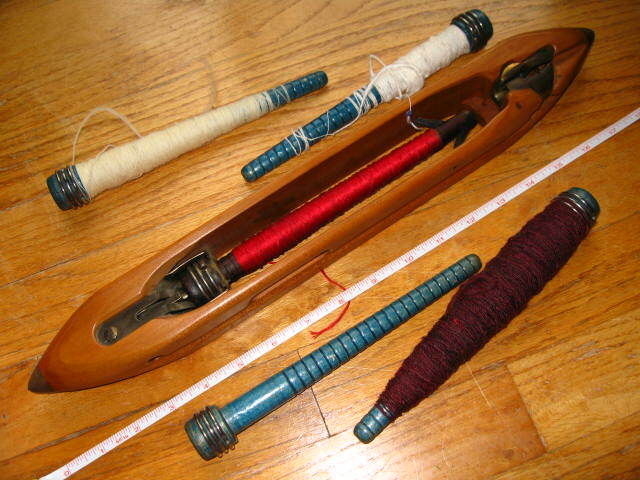 I wound a few other bobbins, including a full 6″ bobbin, wound off from another identical 6″ bobbin placed on an untensioned but angled (45-degrees) lazy kate. Winding went well until the last third, probably because that bobbin is 2″ longer than the mixer stick attachment, and because the angle of the kate added too much tension on the mixer. The battery life is unbelievable — those same old batteries from years ago are still going strong after winding close to a dozen bobbins. The mixer is a tad weak for filling the two larger Leclerc bobbins completely, but partially filling either of those bobbins is a good option. 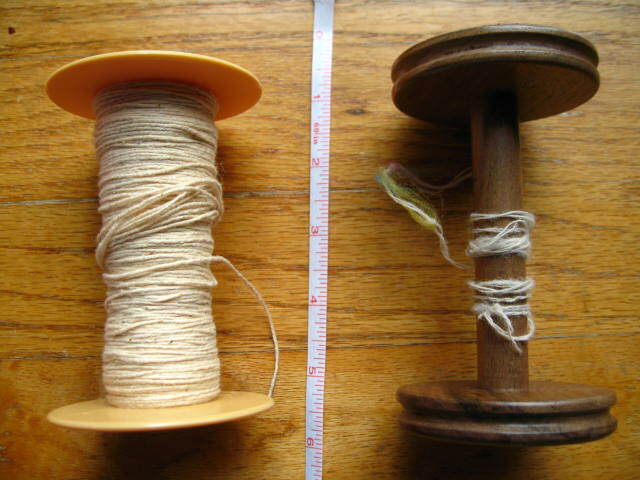 It works best for winding the 4″ bobbins with yarn under little or no tension. 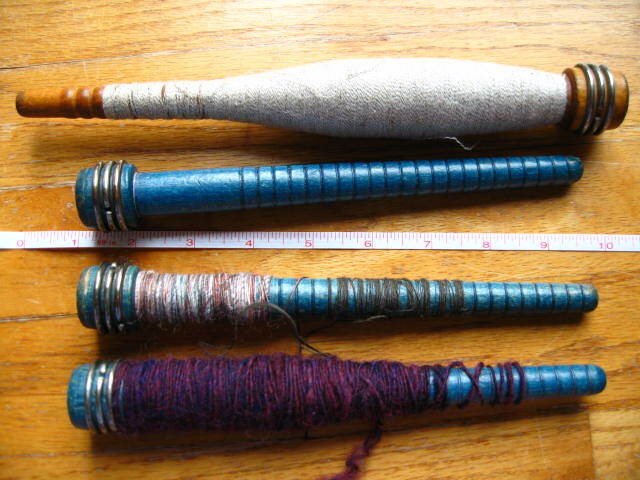 What a wonderful tool to have in your weaving or spinning arsenal and travel bag!